Margaret and Bob Fagan hail from the Blue Mountains and began their musical journey together in Canberra in the late 1960s. They are firm favourites at major festivals around Australia, both as a duo and as members of ‘The Fagans’. Their strong blend of politically-edged traditional and contemporary songs combined with lyrical ballads and great choruses is guaranteed to lift your spirits. 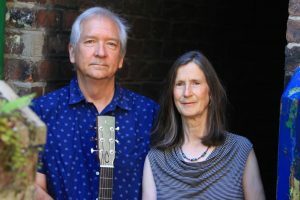 Through a repertoire rooted firmly in the folk tradition, Margaret’s pure voice and Bob’s superb guitar playing ensure their popularity here and overseas. This year they will be launching their new duo CD, Landmarks on the Journey.